This tutorial is a short and practical introduction to linear algebra as it applies to game development. Linear algebra is the study of vectors and their uses. Vectors have many applications in both 2D and 3D development and Godot uses them extensively. Developing a good understanding of vector math is essential to becoming a strong game developer. 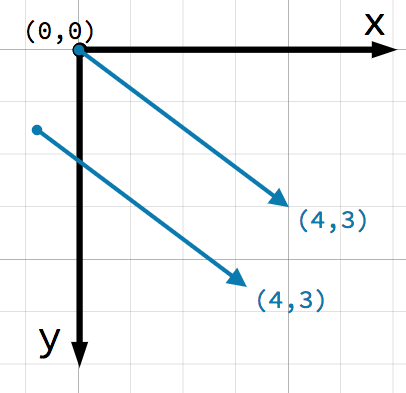 In 2D space, coordinates are defined using a horizontal axis (x) and a vertical axis (y). A particular position in 2D space is written as a pair of values such as (4, 3). 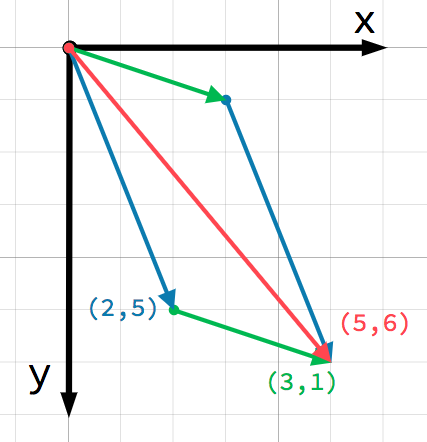 If you’re new to computer graphics, it might seem odd that the positive y axis points downwards instead of upwards, as you probably learned in math class. However, this is common in most computer graphics applications. This is a vector. A vector represents a lot of useful information. 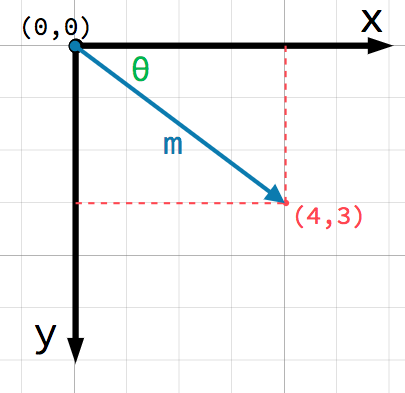 As well as telling us that the point is at (4, 3), we can also think of it as an angle θ and a length (or magnitude) m. In this case, the arrow is a position vector - it denotes a position in space, relative to the origin. Both vectors represent a point 4 units to the right and 3 units below some starting point. It does not matter where on the plane you draw the vector, it always represents a relative direction and magnitude. Godot supports both Vector2 and Vector3 for 2D and 3D usage, respectively. The same mathematical rules discussed in this article apply to both types. The individual components of the vector can be accessed directly by name. Note that adding a + b gives the same result as b + a.
Vectors represent both direction and magnitude. A value representing only magnitude is called a scalar. Multiplying a vector by a scalar does not change its direction, only its magnitude. This is how you scale a vector. Let’s look at two common uses for vector addition and subtraction. A vector can represent any quantity with a magnitude and direction. Typical examples are: position, velocity, acceleration, and force. 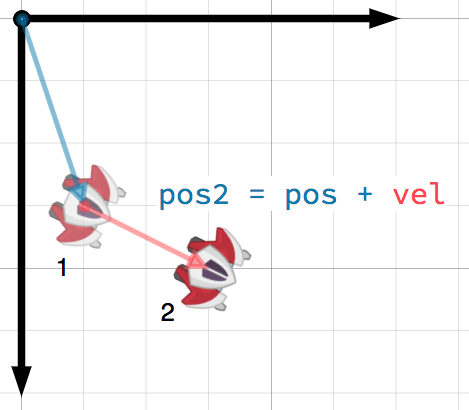 In this image, the spaceship at step 1 has a position vector of (1,3) and a velocity vector of (2,1). The velocity vector represents how far the ship moves each step. We can find the position for step 2 by adding the velocity to the current position. Velocity measures the change in position per unit of time. 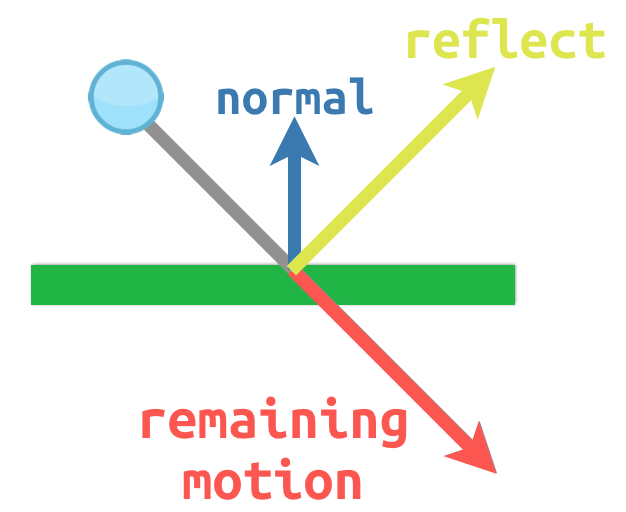 The new position is found by adding velocity to the previous position. In this scenario, you have a tank that wishes to point its turret at a robot. 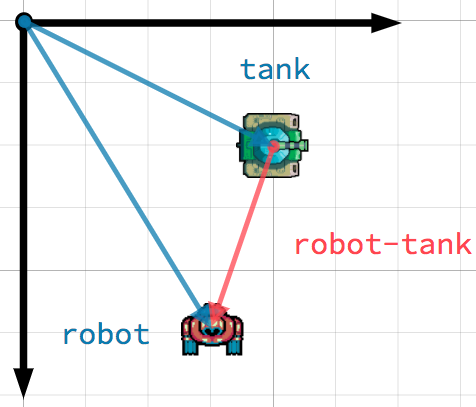 Subtracting the tank’s position from the robot’s position gives the vector pointing from the tank to the robot. To find a vector pointing from A to B use B - A. A vector with magnitude of 1 is called a unit vector. They are also sometimes referred to as direction vectors or normals. Unit vectors are helpful when you need to keep track of a direction. Because normalization involves dividing by the vector’s length, you cannot normalize a vector of length 0. Attempting to do so will result in an error. A common use of unit vectors is to indicate normals. Normal vectors are unit vectors aligned perpendicularly to a surface, defining its direction. They are commonly used for lighting, collisions, and other operations involving surfaces. The dot product is one of the most important concepts in vector math, but is often misunderstood. Dot product is an operation on two vectors that returns a scalar. Unlike a vector, which contains both magnitude and direction, a scalar value has only magnitude. When using unit vectors, the result will always be between -1 (180°) and 1 (0°). We can use this fact to detect whether an object is facing toward another object. 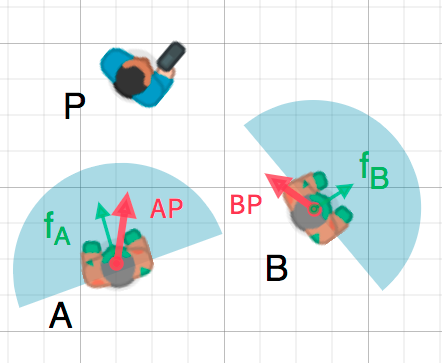 In the diagram below, the player P is trying to avoid the zombies A and B. Assuming a zombie’s field of view is 180°, can they see the player? The green arrows fA and fB are unit vectors representing the zombies’ facing directions and the blue semicircle represents its field of view. For zombie A, we find the direction vector AP pointing to the player using P - A and normalize it. If the angle between this vector and the facing vector is less than 90°, then the zombie can see the player. 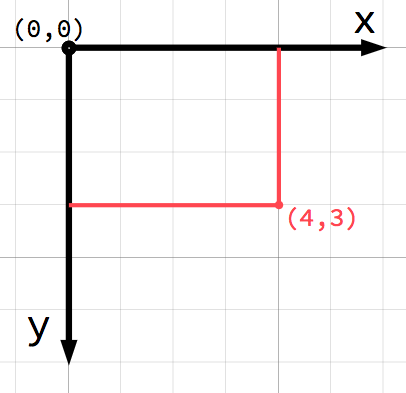 Like the dot product, the cross product is an operation on two vectors. However, the result of the cross product is a vector with a direction that is perpendicular to both. Its magnitude depends on their relative angle. If two vectors are parallel, the result of their cross product will be a null vector. In the cross product, order matters. a.cross(b) does not give the same result as b.cross(a). The resulting vectors point in opposite directions. One common use of cross products is to find the surface normal of a plane or surface in 3D space. If we have the triangle ABC we can use vector subtraction to find two edges AB and AC. 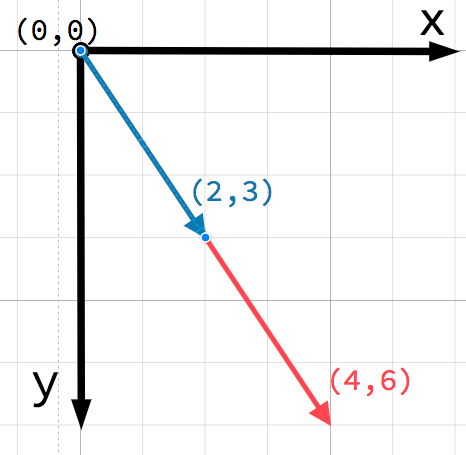 Using the cross product, AB x AC produces a vector perpendicular to both: the surface normal. In the dot product section above, we saw how it could be used to find the angle between two vectors. However, in 3D, this is not enough information. We also need to know what axis to rotate around. We can find that by calculating the cross product of the current facing direction and the target direction. The resulting perpendicular vector is the axis of rotation.